Lessons from West: Do Texas Land Use Laws Put Residents at Risk? After a fertilizer plant explosion killed 15 people in West, observers blamed Texas's lax zoning regulations. Analysis of the locations of such plants across the Western U.S. seeks to determine whether Texas land use law is uniquely unregulated. Texas land use law became the subject of national debate in the wake of the April 17th West Fertilizer Plant explosion. The blast killed fifteen people, injured scores more and caused an estimated $230 million in damage. There were three schools and a nursing home within half a mile of the plant (see the figure below) and many blamed lax zoning regulations for putting the people of West at risk. So is Texas land use law uniquely unregulated? If it is, then there should be more sensitive land uses surrounding Texas fertilizer plants then elsewhere. 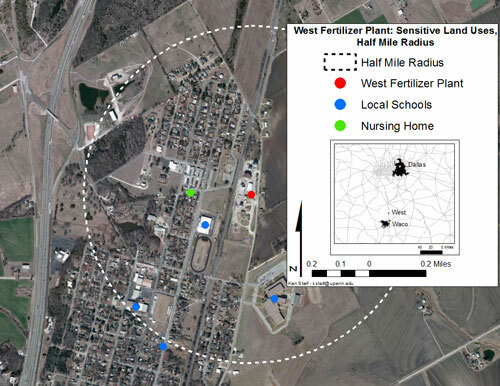 Analysis of the locations of fertilizer manufacturing and mixing plants across the western United States leads to the surprising conclusion that across the nation there are a great number of schools, nursing homes and day care centers within close proximity to these hazardous facilities. Texas state law enables localities to zone for "public health, safety, morals, or general welfare", but the state also has a long tradition of market-oriented urbanism. Houston, as is well known, is the only major American city without zoning laws. This laissez-faire approach to planning hinges on the fact that a developer would be unlikely to build next to a fertilizer plant because a tenant's willingness to pay for that location would be diminished. These market forces are not in play for non-profit land uses like schools, and in Texas there are no state mandated rules regarding the location of schools. Of course, it's impossible to ask what would have happened had West enforced stronger land use regulation, but we can do some comparative analysis to see if, on average, the ramifications of a plant explosion in Texas would have been more severe than an explosion elsewhere. 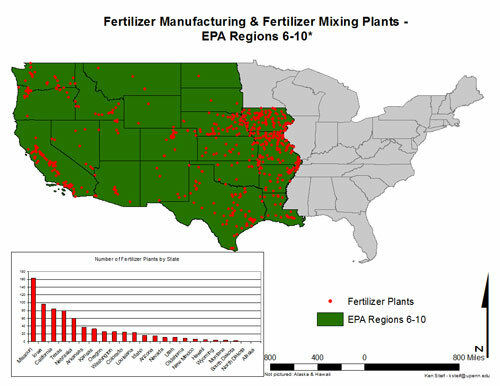 To do so, I gathered addresses of fertilizer manufacturing and mixing plants across the 24 states that make up EPA regions 6 through 10. These data come from the EPA's "Facility Registry System" - a database of "places subject to environmental regulations." Population and housing unit counts were collected at the Census Block level (the smallest Census geography) along with address level data on schools from the National Center for Education Statistics; and additional address level data on hospitals, nursing homes and day care centers. A half-mile 'buffer' was generated around each fertilizer plant and the number of sensitive land uses within each buffer was counted. Finally these counts were averaged for Texas and non-Texas plants. 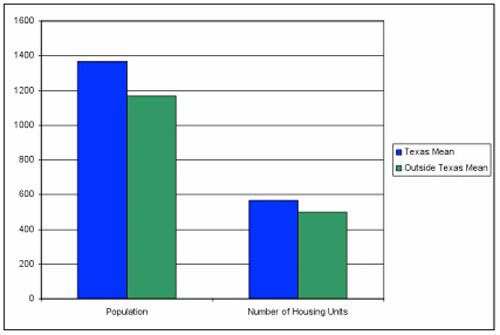 The below table and charts illustrate some of the land use comparisons. Number of Housing Units within 0.5 mi. Number of Schools within 0.5 mi. Number of Hospitals within 0.5 mi. Number of Daycares within 0.5 mi. 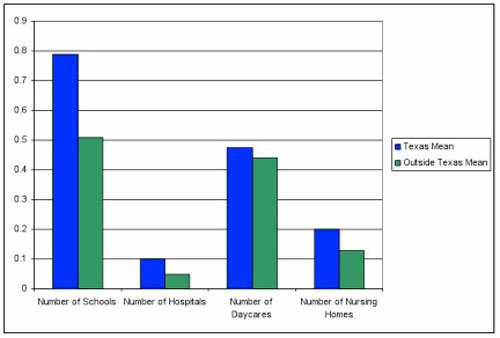 Number of Nursing Homes within 0.5 mi. On average, there are more population and housing units surrounding plants in Texas then elsewhere, but the difference is marginal. And although there are large differences in the number of hospitals within half a mile of fertilizer plants, the total number of hospitals is small. What is surprising is that for every ten fertilizer plants in Texas, there are eight schools within half a mile. That seems a bit dangerous. Even more unexpected however, is that for every ten non-Texas fertilizer plants included in the analysis, there are five schools within half a mile. That's a lot of towns in the West and Midwest that are one industrial accident away from catastrophe. So are Texas land use laws weak with respect to the locations of fertilizer plants? Probably - but not much weaker then land use laws elsewhere. Although zoning is a useful tool for separating non-complimentary land uses, perhaps the failure in West is less about land use law and more about a legacy of industrial towns. In many of these places, housing and residential services like schools simply grew up around the local factory. Having said that, according to The New York Times, the last time the West Fertilizer Plant was inspected was in February of 1985. If Texas insists on more libertarian land use law, the least they could do is inspect their environmentally sensitive plants a little more then once in a blue moon. Ken Steif is a Doctoral Fellow in the City & Regional Planning Program at the University of Pennsylvania.